China will reportedly finance the so-called ‘Peace Pipeline’ natural gas pipeline from Iran, home to the world’s second largest reserves, to energy-deprived Pakistan. The project was delayed due to US dissent. The final deal is to be signed during the long-sought visit of Chinese President Xi Jinping to Islamabad in April, the Wall Street Journal reported on Thursday. “We’re building it. The process has started,” Pakistani Petroleum Minister Shahid Khaqan Abbasi told the WSJ. 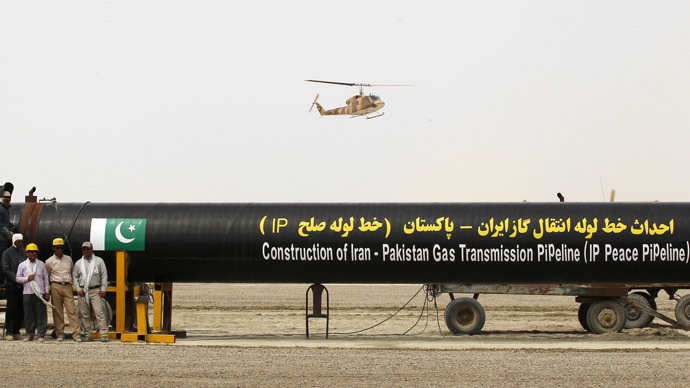 First proposed over 20 years ago, the 1045 mile (1682km) pipeline will transfer gas from Iran’s south to the Pakistani cities of Gwadar and Nawabshah. Karachi, the country’s biggest city of 27.3 million, will also be connected via local energy distribution systems already in place. Iran has said the 560-mile portion that runs to the Pakistan border is already complete, which only leaves $2 billion needed to build the Pakistani stretch. The project could cost up to $2 billion if a Liquefied Natural Gas port is constructed at Gwadar. Otherwise, the project to complete the Pakistani pipeline will cost between $1.5 billion to $1.8 billion, the WSJ said. Pakistan is in negotiations with China Petroleum Pipeline Bureau, a subsidiary of Chinese energy major China National Petroleum Corporation, to finance 85 percent of the project. Pakistan will pay the rest. The original plan envisioned the pipeline continuing to India, but Delhi dropped out due to US pressure in 2009, Tehran claims. Pakistan, a country of 199 million people faces intermittent blackouts in major cities, and Iran is looking for a place to export its soon-to-not-be-banned gas. Iran has 33.7 trillion cubic meters of gas reserves according to the June 2014 BP Statistical Review of World Energy. According to BP estimates, it has the world’s fourth-largest oil reserves at 157 billion barrels. US-led sanctions against Iran over its nuclear program have stunted Iran’s oil and gas industry. Iran’s oil exports have dropped from 2.5 million barrels a day in 2011 to about one million barrels in 2014, according to the US Energy Information Administration (EIA). In March, Iran produced 2.85 million barrels of oil per day, according to data from Bloomberg.